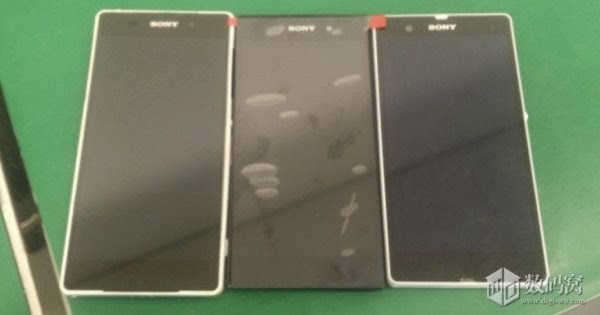 The Sony Xperia Sirius D6503 has been shown in several pictures , including videos , but new photos of the device keep coming . In today's leak , it gives the air of grace in two colors , a model in black and one in white, still having the size of housing compared to the Xperia Z and Z1 , which is higher than the two current models of the brand . In the picture , you can check that Sirius or Z2 is actually larger than their predecessors . This should be a result of the larger screen that can measure 5.2 '' compared with the screens 5'' Z and Z1 . Further details about the device were not disclosed in this opportunity . Still, a website selling Japanese spare parts aired an ad for the sale of the back cover of the Xperia D6503 , calling the device Xperia Z2 . It is believed that Sony presents this new smartphone on the 24th of February at their conference at MWC and start selling the device in April . The rumors so far , indicate the presence of a 800 Snapdragon quad -core , 3 GB RAM and 32 GB of internal storage processor. The camera can be a 20.7 MP and Android 4.4.2 OS should be . Check out the pictures of the back cover sold by Japanese Store and the comparison between white and black model on the new device.